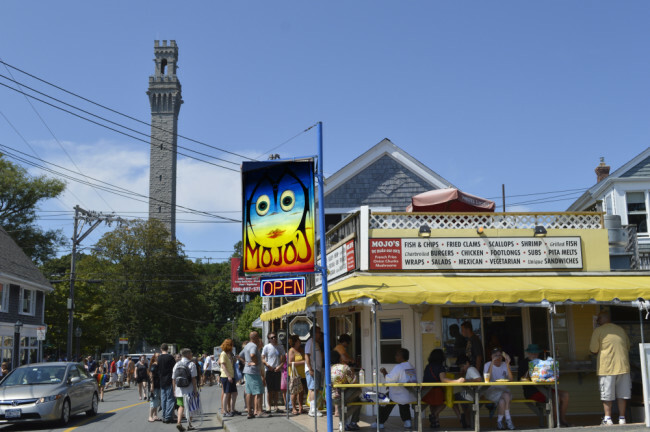 There's nothing fancy about Mojo's restaurant in Provincetown, which might be part of its charm for Townies and long-time visitors who count it among their favorite spots for a quick bite or a full meal. So, naturally, I had to check it out upon hearing it had a new owner. Happily, this couldn't be a better match. More on that in a moment. First, the important stuff… What I ate! creamy, spicy chipotle sauce, all on a 6 ounce burger. I added their unique fries. I just tried Mojo's new 6 ounce Chipotle Burger. It comes with bacon and cheddar cheese, topped with a delicious chipotle sauce, for a mere $7.10. This nice, creamy, homemade sauce is quite spicy, but not overpowering. It’s just right. And my burger was cooked medium, just the way I ordered it, which doesn’t always happen at a burger shack, so they get extra points for that. 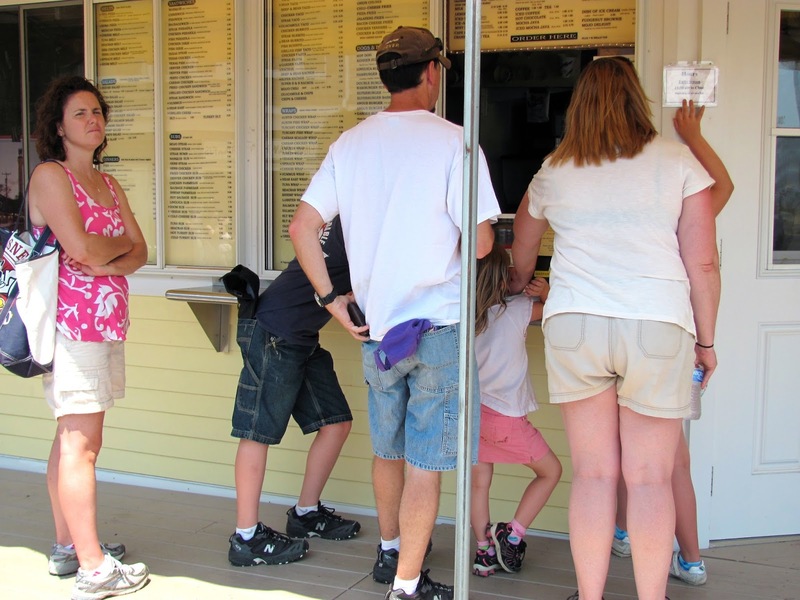 You can’t really call this fast food, although the orders roll out of the kitchen pretty quickly. But everything here is made to order, when you walk up and ask for it, or call in your order for pickup. I added their unusual, signature fries to my order; hand-cut discs sliced from fresh potatoes, so they're a little like extra, EXTRA thick potato chips, but not so crunchy. These fries are a real specialty at Mojo's, and come in 3 sizes. I ordered the small one, which was plenty with this good-sized, great tasting burger, making a satisfying meal for not much money, and a cut above the fast food chains found in the world outside of Provincetown. MacMillan Pier. Photo from the Menuism website. Visit to see Mojo's huge menu. 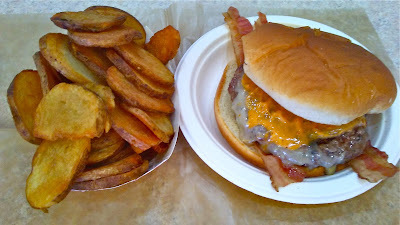 I’m going to do a series of articles on burgers around PTown, the way I did on lobster rolls a couple of years ago. I’ll taste burgers all over town and describe each one, and take a photo, and tell you a little about the restaurant itself, so you can decide which ones you want to try. It’s clear that I’ll have to make several visits to Mojo’s, since they offer 15 burgers in different sizes, shapes and motifs. I won’t have time to try each one, since there are 78 other eateries in PTown for me to get to, but I’ll eat a few of them, in a range starting at $3.95 for a plain quarter-pound hamburger, so you can add your own mustard, ketchup, onions or hot sauce and have it just the way you like it. Ask for mayo if you want it. Lettuce and tomato will set you back an extra 60 cents, cheese (four choices) will add 75 cents, and bacon is $1.25. from a menu of over 170 burgers, wraps, salads, tacos, seafood, sides and more. From there we move up to the Superburger. It's 6 ounces of ground beef served with mayo, lettuce, tomato and pickle for $6.25. Again, add condiments to your own taste. The Angus Burger is 8 ounces, also served with mayo, lettuce, tomato and pickle, for $8.95, or served as a full meal, with fries, salad and veggies, for $13.95. Now there’s a deal! Try beating that price anywhere else. 11 other full dinners, like grilled tuna or salmon, chicken Parmesan, or steak tips range from $10.25 to $15.50, with scallops, broiled or fried, priced daily depending on the market price. There are 9 specialty burgers, each 6 ounces, most of them at $6.75, like the chili burger with cheddar, the Texas burger with coleslaw and BBQ sauce, or the New York burger, with herbed cream cheese and its own sauce. There’s a hamburger sub, too. So, clearly, I’m going to have to try a few more for my upcoming burger series, and let you know what I find. Mojo’s is under new ownership this year, thankfully acquired by a local woman who won’t make any drastic changes to the place or its very popular, very large menu, which includes about 170 items and meals. Courtney Hurst grew up here, graduating from Provincetown High School in 1994. Her first jobs were in shops less than 50 yards from Mojo's, so she had meals there almost daily, and would dash over for an order of cheese fries whenever she could. Finding this little PTown eatery for sale recently, she went with her heart, and immediately bought the place that held such fond memories for her, and for countless other residents and summer visitors. of whalers,, fishermen and others (even newspapers!) over a period of many years. I have a fondness for Mojo’s, too. I got the inspiration for my very first blog post while eating a guacamole taco, one of many vegetarian choices on Mojo's menu. I was sitting on their dining patio in June of 2012, next to artist Bill Evaul’s mural, painted on the back wall of the restaurant in 1978. It depicts the sea serpent spotted off the shoreline of Provincetown, near Race Point, in 1819. 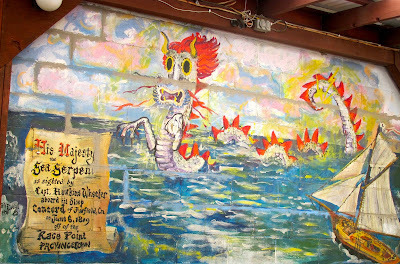 Read Public Art Meets PTown Legend, the first blog post I ever wrote, to see why I’ve come to believe most of the stories about this legendary creature. Enjoy this whimsical painting yourself while you’re having a quick bite or a favorite meal at Mojo’s, going strong in its 44th year serving Townies and visitors some of the best bargains in Provincetown. stir things up too much in her first season, which keeps us all quite happy. We welcome her back to the neighborhood, and wish her great success in her new chapter at Mojo's.